Have you ever wondered if there are easier ways to learn music? The fact is that most people like music, but it's not easy to learn music. Then, can we at least make the process easier and faster? We know how to do it. We intergrated Do Re Mi (aka Solfege) into digital instruments. Now, every note you play is clearly identified by Do Re Mi. This makes music learning so much easier and more importantly fun. If this sounds interesting to you, you have come to the right place. If you have never experienced Do Re Mi, here is the famous Do Re Mi song in youtube. Do Re Mi is such a powerful tool used in Music Education for a long time. Yet, there are some shortcomings. For one thing, you need a teacher. With this technology, you have the teacher right on your side, 24/7. Not only that, if he talks to you too much, you can make him disapper by a click of a button and re-appear by another click. How cool is that! Now you know why we are very excited about this technology. By the way, Do Re Mi is also known as Solfege. Some people think that Solfege is for singers or singing. Not true, it's for everyone. It is a powerful tool to train your ears. Now, we are happy to inform you that DoremiPlus Piano & Synthesizer is available from Apple App Store in the US. If you have an iPhone, iPad or iPod with iOS 8 or later, please check it out. The base functionality is free. If you are experiencing a problem, please check this page first. We have compiled all the issues and potential solutions for them. If you do not find a solution, please contact us at info@doremiplus.com. Bluetooth MIDI is not officially supported although we implemented User Interface (UI) for selecting a Bluetooth MIDI device. Newer iPhones are not equipped with a 3.5 mm headset jack. This is a problem when you want to use a USB MIDI and headset at the same time. We hoped that Bluetooth MIDI could help the situation, but the latecy is too great for piano players. This is due to the Bluetooth LE specification. There is nothing we can do about it. Please use a wired connection to your MIDI keyboard, instead. Due to the inherent latencies in Bluetooth devices, they are not supported. Wired headsets or wired speaker systems work just fine. The app does not handle a disconnection of a Bluetooth sound output device well. You need to restart your device to resume the sound from the app. Other sound apps sometimes hold up the sound device for their exclusive access. When this happens, you cannot get sound from the app. You need to restart your device to resume the sound from the app. Our app collects none of your personal information at this moment. We will inform you when we change our policy in the future. Are you insterested in making your musical instruments easier for music learning? If your answer is yes, integrate Do Re Mi into your digital musical instruments or software products. This technology will make your instruments more appealling to your audience. This works for self learners as well as classroom settings by providing you remote control features. The idea itself is not new actually. But, no one has been able to bring a real product to the market. After many years of Research and Development, this dream became a reality. We have a soon-to-issue patent pending technology to enable the next level of music learning into digital musical instruments and a variety of devices so that a keyboard without DoremiPlus can be converted into DoremiPlus Keyboard. We also have another patent pending technology which allows a full implementaiton of DoremiPlus into the current MIDI wavetable synthesizers. We are here to license these technologies for a wide variety of audiences, such as music instruments manufacturers and music software developers. If you are interested in learning this technology, please contact us at info@doremiplus.com. We are looking for investors interested in changing the way we learn music. We have come to an important milestone as we have a real product which proves that this technology is now feasible. This technology is multi-fauceted. It is not only related to musical instrument manufacturers and music software developers (Technology Side), but also related to music publishers and music educators (Education Side), all over the world. You can make a difference and will be rewarded for it. You might wonder how big the market is. We simply say this: Every class room equipped with pianos and digital keyboards, which might include your household If you are interested in this opportunity, please contact us at info@doremiplus.com. We license our IP (Intellectual Property) to manufacturers and software developers. We levelage the existing business and create a win-win situation. This reduces risks and makes it possible to bring final products faster. Additional benefit will be more choices for end users and lower costs. What's exciting is that this technology involves many businesses around music, creating synergetic environment around the world. DoremiPlus is a set of phonetic codes of music as illustrated in the next column. Unlike conventional Solfege, it does not have spelling issues, which confuse beginning students. 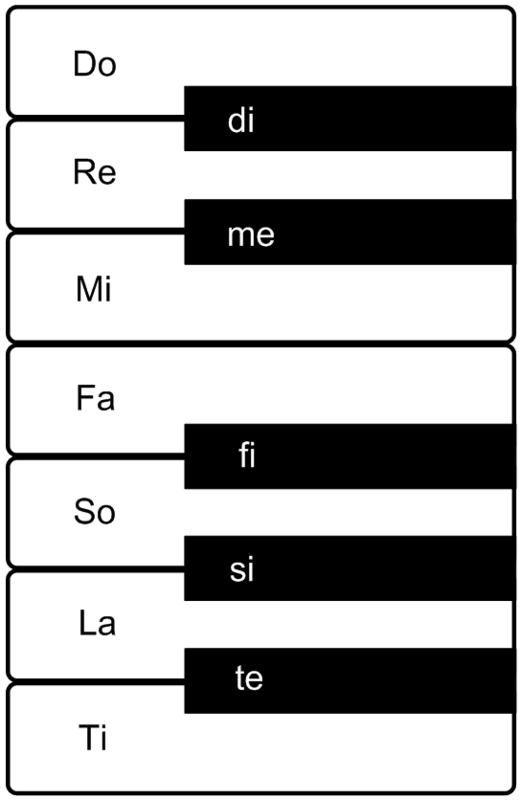 The simplest implementation utilizing standard MIDI wave table based synthesizer (Hardware/Software) covers the standard 88 piano keys with Do Re Mi (aka Solfege) note identifications for one MIDI channel. It supports both Fixed Do and movable Do Systems. The setting can be changed locally with hardware or software switches or remotely through special MIDI commands. More elaborated implementations can be performed with more MIDI channels and/or a full customization. DoremiPlus can support both Fixed Do and Movable Do Systems. Regardsless of your choice, it simply works. It can be remotely controlled. It is handy for class room settings especially if you are using Movable Do System. Your new key can be set for all the keyboards in the classroom with a click of a button. DoremiPlus is a set of phonetic codes of music. It is a subset of conventional Solfege. Nothing is wasted if you teach Solfege. Unless you tackle complicated songs, DoremiPlus feels just like home. You will immediately notice the benefit of using DoremiPlus equipped keyboards. Your students start paying attention to every note they play. Isn't that what you want your students to do? The promotional video was recorded at Silicon Valley Piano. They carry fine pianos. You can visit the store on-line. This website is designed by Leon, Yi-Fan, Heng. Please visit his website to learn his portfolio.